In our day today’s life, we often use the term broadband service in context of internet. However, some of us don’t even know its meaning or technology; still we can have a great discussion over it. So, now if you want to have a discussion over broadband service, firstly know its meaning and technology which certainly enables you to put forward the opinions more easily. The term broadband refers to a high-speed data transmission, which is faster than traditional dial-up system. This type of data transmission can carry large amount of data via a single medium (cable or wire) in a given time. There are different types of transmissions are being used in present time as in high speed technologies such as Digital Subscriber Line (DSL), coaxial cable modems (where cable TV connections are used in conjunction with broadband internet), cable modems (which use existing phone lines for internet transmission), fiber-optic technology as well as broadband over power lines (BPL). In present time broadband transmission can be both wireless and wired. When it is a wired connection, then we are basically talking about the physical connection to a physical location via a connecting cable however wireless connection is also successful and most of us like it more than wired connection. The majorly used three main types of wired broadband connections that are used at businesses and home are DSL connections, coaxial cables and fiber-optic cables. On the other hand, each of these wired technologies can be accessed wirelessly throughout your home or office via Wi-Fi router. A broadband internet service based on the coaxial cables is one of the most popular ways of accessing internet. It is even faster than DSL service. In the external cable there are mostly two outlets, one for cable TV and another for the internet. When it comes to access internet in television, all you have to do is switch on the computer to access internet along with television signals. With this step, one can get the access to broadband over coaxial cables and both features and activities can be used at a same time without any interference from each other. Keeping in mind the use of broadband internet amongst users, Tripleplay assure customers for providing best broadband service. Amongst all, fiber optic cable is comparatively new and converts electrical pulses into light pulses before transporting them through very slim glass fibers. It is a bit expensive as the technology is new and it requires expensive devices for converting and reconverting electrical signals due to which error in connection is rare to find. 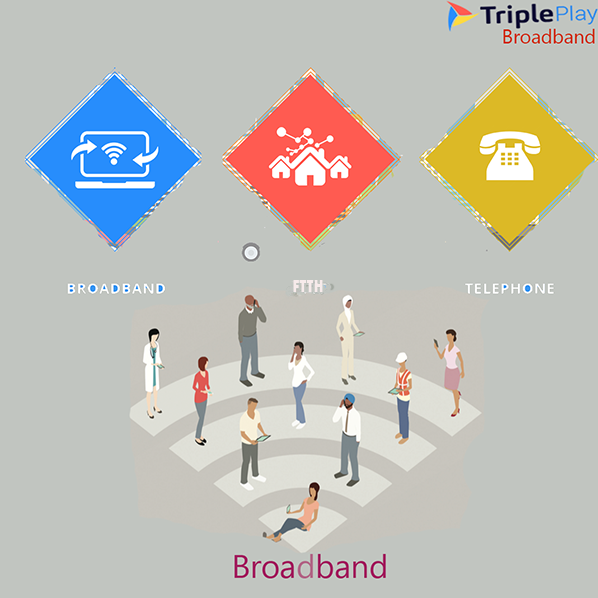 Tripleplay is dedicated to provide the best internet service in across Delhi and NCR. So, get in touch with the experts and avail its best service at affordable prices. The professionals at Tripleplay are quite concerned about providing quality service to its clientele and make sure they are satisfied with company’s service. So, get the best and cost effective broadband service from Tripleplay and make your internet use easier for yourself.